Stocks ended modestly higher Thursday after Federal Reserve chair nominee Janet Yellen indicated in a Senate hearing that she will continue to support the economy with stimulus measures. 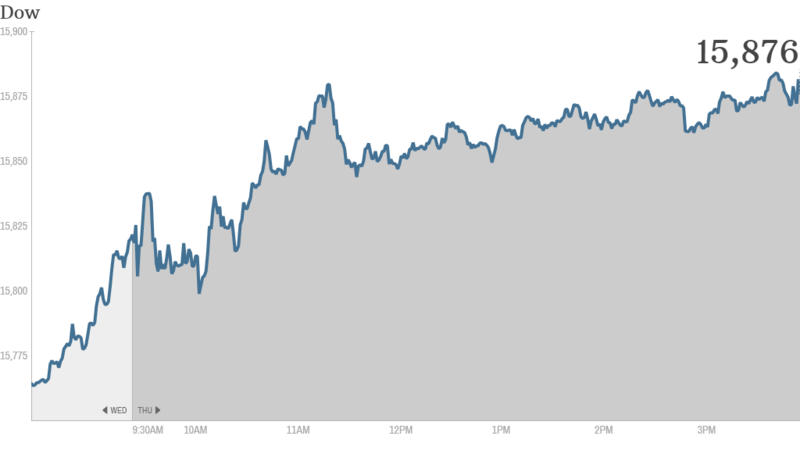 Investors were encouraged and sent the Dow Jones Industrial Average and S&P 500 to new records. The Dow is now just 1% from hitting 16,000, while the S&P 500 is less than 1% from 1,800. The Nasdaq lagged behind the other two major indexes, as a drop in Cisco (CSCO) shares weighed on the tech-heavy index. But the Nasdaq also rose slightly. It is now at its highest level since September 2000 and is less than 1% from 4,000. Investors have been looking for clues as to when the Fed may begin scaling back its bond purchases. There has been speculation that the so-called tapering could begin as early as next month. But during her question and answer session on Capitol Hill, Yellen said that the bond-buying program could still help the economy. The comments appear to have convinced investors that Yellen would continue the Fed's current $85-billion-per-month bond-buying program for the next few months. The program -- also known as quantitative easing or 'QE' -- has helped spur stocks by pumping markets with extra cash. Cisco slide weighs on tech sector: Cisco (CSCO) shares tumbled more than 10% after the company reported weak sales for the fiscal first quarter and issued a weak outlook for the current quarter, too. Cisco CEO John Chambers blamed a "hard to read" economic environment, adding that the U.S. government shutdown increased the "lack of confidence among business leaders." Though Cisco shares put pressure on some other tech stocks, StockTwits user orangecrusher13 pointed out the bright side. "$CSCO creating opportunities in other tech names," he said. "Working my shopping list hard." Another trader believed that Cisco eventually would bounce back. "$CSCO It will be back to $25 by the next earnings announcement," said jdegiorgio. "Goldman has it valued @ $25. S&P has it valued @ $29." StockTwits user Lach14 pointed out that although Cisco shares were weighing on the tech sector, the broader market was still up thanks to the Fed. "$SPY - All ignoring $CSCO's disastrous erngs report - which used to be a bellweather for Global economy," he said. "It's all about QE, QE, QE...."
Wal-Mart (WMT) reported better-than-expected earnings, though the retailer missed on revenue and reported a slight decline in same-store sales in the U.S. Shares of department store chain Kohl's (KSS) plunged following poor results and a weak outlook. 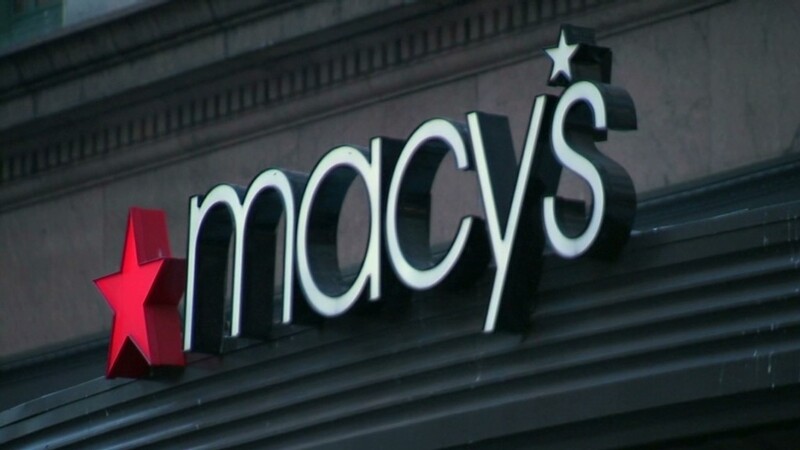 The bad news from these two retailers comes one day after Macy's (M) ignited a retail rally thanks to its strong sales and guidance. "I thought a slight $M beat meant every retail stock would beat and go up 10%? "#newnormal #insanity $KSS $WMT," said mytfine. StockTwits user silverjet2 noted that while Macy's and even Michael Kors (KORS) are still attracting shoppers, the economy otherwise is forcing consumers to keep a tight grip on their wallets. Though thanks to the ongoing housing recovery, home improvement giants Lowe's (LOW) and Home Depot (HD) are still improving. "$M $KORS aside, economy is restraining shoppers $WMT $KSS," he said. "Interesting to note whether money is being spent on home improvements, $LOW $HD." European markets ended with modest gains following the news that the eurozone economy grew by 0.1% in the third quarter, in line with economists' expectations. Asian markets closed higher. A weaker yen helped Japan's Nikkei jump 2.1%. The currency eased after a report showed Japan's economy grew 1.9% in the third quarter - a sharp slowdown from the previous quarter.